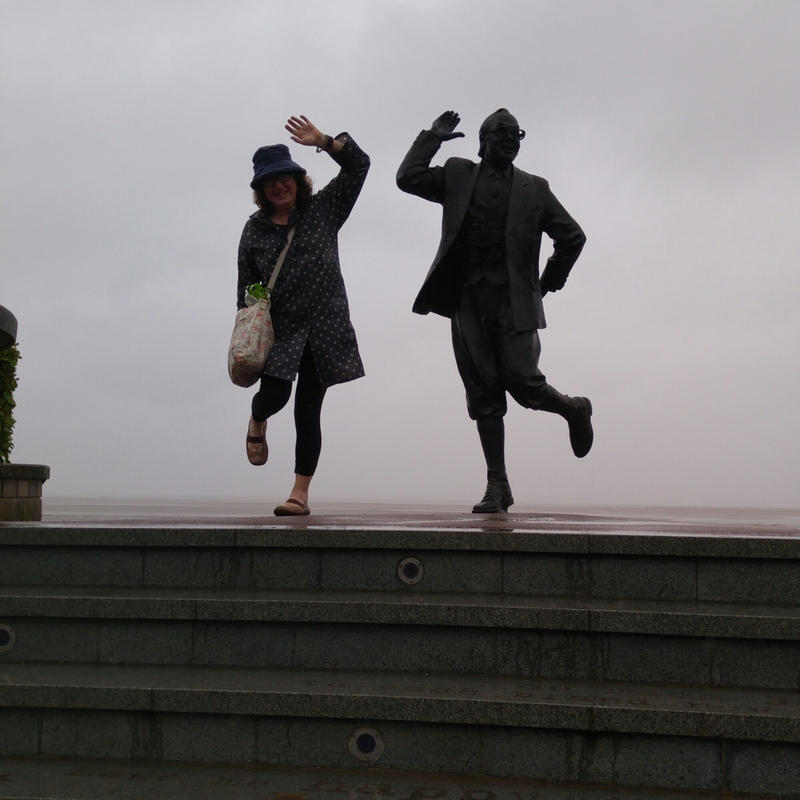 Even the great Eric Morecambe, this small town’s most famous son, commemorated on the seafront by a statue, couldn’t bring sunshine to Morecambe Bay the day we broke our journey there on the way to Scotland. But his cheerful spirit abounded at the local branch of family pub chain Wetherspoons, named The Eric Bartholomew (his birth name) in his honour, where we breakfasted. Cheerful young bar staff called all the customers by terms of endearment that would have sounded more at home from the mouths of the largely middle-aged-to-elderly clientele, who were already enjoying their hospitality with everything from tea and toast to pints of lager and bottles of wine. One old man had nearly finished a bottle of wine at elevenses time. I guess the good news was that he was drinking it indoors out of a glass instead of a brown paper bag, while chatting companionably with the morning coffee brigade. Despite the grey weather, it was good to see that this classic seaside town was looking considerably less seedy and neglected than on previous visits, with whole rows of terraced B&Bs along the seafront sporting “No Vacancies” signs.There is also a major construction project going on to revitalise the promenade. It’s being financed by locally rather than by the EU, I noticed. I loved the decorative pavement edging inspired by local fossils. The town has a proud and creative spirit, as shown by the original artworks nestling among vibrant-hued corporation planting. Seabird sculptures are everywhere, and a joyful statue of a mother twirling a child by the hands is the last you see of the town heading north along the coast road.These sit comfortably alongside more traditional landmarks such as this cute clock tower that looked like something straight out of Trumpton. 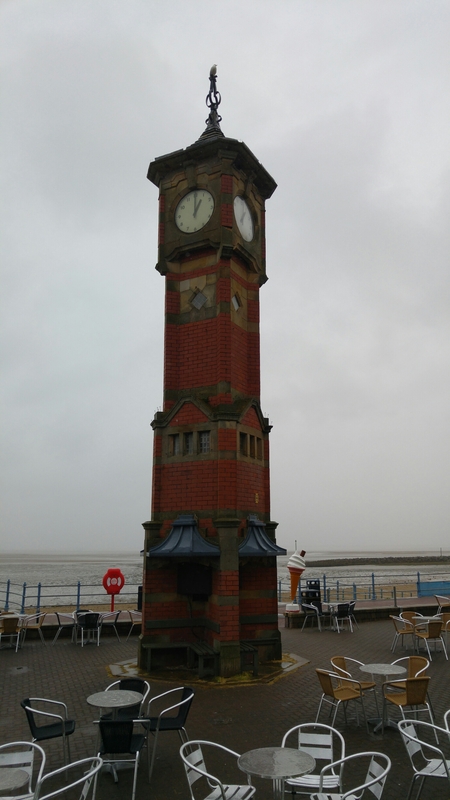 They’ve even managed to annexe the Lake District by placing a striking sculpture on the seafront indicating the hills theoretically visible from Morecambe. Lesser towns would have made do with a map. 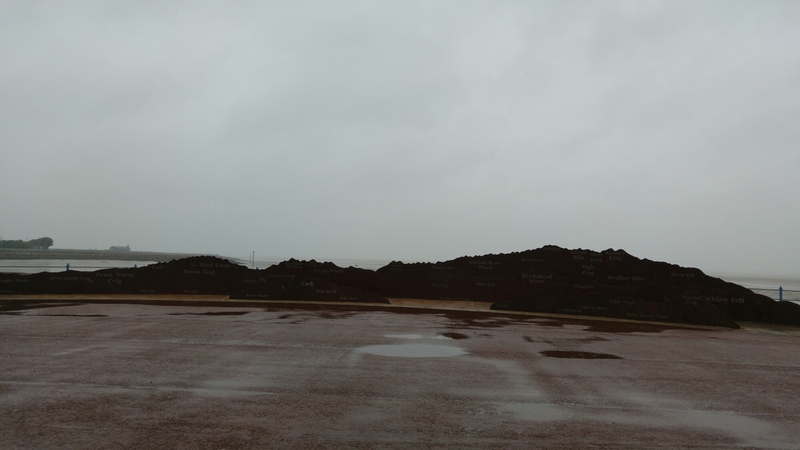 Even though the rain obscured every one of the peaks that morning, the sculpture added to our positive experience of Morecambe. Despite these highlights, it’s still impossible to visit this place without remembering the tragedy of the Chinese immigrant workers who lost their lives gathering cockles here a few years ago. The warning signs on the prom might seem laughably over the top to anyone who wasn’t aware of the serious dangers lurking in these treacherous shifting flat sands. This region also inspired the multiple-award-winning, highly atmospheric novel The Loney by Andrew Michael Hurley, which I reviewed for Vine Leaves Literary Journal here. Wherever you are holidaying this summer, respect the water and the hills, stay safe, and have fun, and I hope someone like Eric Morecambe brings you sunshine. This is really interesting Debbie. I’ve added it to my list of places to visit. Sounds like Morecombe is readying itself for more Brits holidaying within the island!